Several massive explosions rocked the Gaza Strip on Thursday night amid multiple reports of Israeli jets buzzing the area. It follows reports that two rockets were launched from Gaza into Israel but failed to cause any damage. At least three major blasts rocked Gaza city as Twitter got flooded with reports of residents waking up to the sounds of airstrikes and Israeli F-16 jets flying over. The strikes took place in the western part of the strip, near the Maqousi Towers residential area. Khan Younis and Ubaidah garrison of Hamas-affiliated Al-Qassam Brigades were also struck. There were no immediate reports of casualties, said Times of Israel citing Hamas media reports. Hamas said its military facilities were targeted. Earlier on Wednesday, two missiles were fired into Israel from Gaza. However, it was not Hamas, but its rival Salafist group called Omar Brigades, loyal to Islamic State (IS, formerly ISIS/ISIL) that claimed responsibility for the attack. “We are continuing with our jihad against the Jews,” the group said in a statement, claiming the rockets were fired in retaliation for Hamas killing of an IS supporter on Tuesday, according to Reuters. An Israeli army statement cited by Haaretz blamed Hamas for Wednesday’s missile attack. 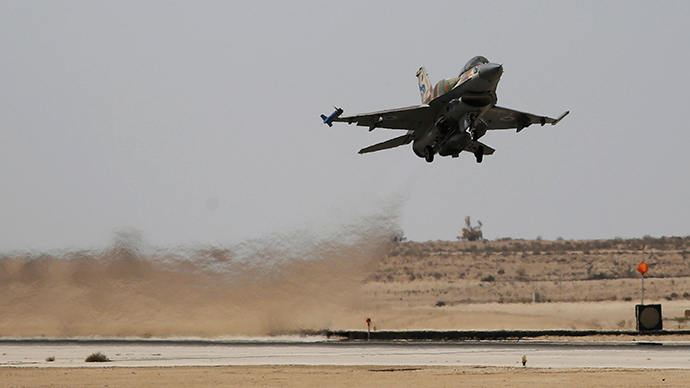 IAF jets struck three “terror infrastructures” in the Gaza Strip, the statement said. The outlet reported that Hamas’ Gaza headquarters had been evacuated prior to the strikes, but the group adamantly denied being behind the launches. Hamas reportedly pointed a finger at the Salafist group, accusing it of trying to provoke a new all-out conflict in Gaza. Hamas security services had reportedly eliminated a senior Salafist, who had been planning attacks against the Palestinian group, just a few days before.